Definition at line 18 of file threefish_512.h. Definition at line 267 of file threefish_512.cpp. Definition at line 30 of file threefish_512.h. Definition at line 162 of file threefish_512.cpp. References Botan::Block_Cipher_Fixed_Params< 64, 64, 0, 1, Tweakable_Block_Cipher >::BLOCK_SIZE, BOTAN_PARALLEL_SIMD_FOR, Botan::load_le(), Botan::store_le(), THREEFISH_DEC_8_ROUNDS, THREEFISH_INJECT_KEY, and Botan::SymmetricAlgorithm::verify_key_set(). Definition at line 126 of file threefish_512.cpp. 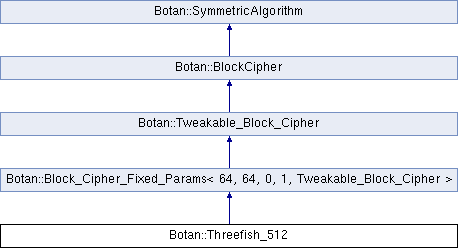 References Botan::Block_Cipher_Fixed_Params< 64, 64, 0, 1, Tweakable_Block_Cipher >::BLOCK_SIZE, BOTAN_PARALLEL_SIMD_FOR, Botan::load_le(), Botan::store_le(), THREEFISH_ENC_8_ROUNDS, THREEFISH_INJECT_KEY, and Botan::SymmetricAlgorithm::verify_key_set(). Definition at line 29 of file threefish_512.h. Definition at line 102 of file threefish_512.cpp. Definition at line 114 of file threefish_512.cpp. Set the tweak value. This must be called after setting a key. The value persists until either set_tweak, set_key, or clear is called. Different algorithms support different tweak length(s). If called with an unsupported length, Invalid_Argument will be thrown. Definition at line 241 of file threefish_512.cpp. References BOTAN_ARG_CHECK, Botan::load_le< uint64_t >(), and Botan::zeroise(). Referenced by Botan::Salsa20::cipher(), Botan::CTR_BE::cipher(), Botan::RC4::cipher(), Botan::SHAKE_128_Cipher::cipher(), Botan::ChaCha::cipher(), Botan::Poly1305::clear(), Botan::DESX::decrypt_n(), Botan::Twofish::decrypt_n(), Botan::IDEA::decrypt_n(), Botan::SM4::decrypt_n(), Botan::Blowfish::decrypt_n(), Botan::XTEA::decrypt_n(), Botan::KASUMI::decrypt_n(), Botan::MISTY1::decrypt_n(), Botan::SEED::decrypt_n(), Botan::CAST_256::decrypt_n(), Botan::Noekeon::decrypt_n(), Botan::CAST_128::decrypt_n(), Botan::SHACAL2::decrypt_n(), Botan::DES::decrypt_n(), decrypt_n(), Botan::Serpent::decrypt_n(), Botan::Lion::decrypt_n(), Botan::TripleDES::decrypt_n(), Botan::GOST_28147_89::decrypt_n(), Botan::DES::encrypt_n(), Botan::SHACAL2::encrypt_n(), Botan::IDEA::encrypt_n(), Botan::Blowfish::encrypt_n(), Botan::SEED::encrypt_n(), Botan::KASUMI::encrypt_n(), Botan::Twofish::encrypt_n(), Botan::XTEA::encrypt_n(), Botan::SM4::encrypt_n(), Botan::MISTY1::encrypt_n(), Botan::DESX::encrypt_n(), Botan::Noekeon::encrypt_n(), Botan::CAST_128::encrypt_n(), Botan::CAST_256::encrypt_n(), encrypt_n(), Botan::Serpent::encrypt_n(), Botan::Lion::encrypt_n(), Botan::TripleDES::encrypt_n(), Botan::GOST_28147_89::encrypt_n(), Botan::OCB_Encryption::finish(), Botan::OCB_Decryption::finish(), Botan::GHASH::ghash_update(), Botan::CFB_Encryption::process(), Botan::CFB_Decryption::process(), Botan::Salsa20::seek(), Botan::CTR_BE::seek(), Botan::ChaCha::seek(), Botan::OCB_Mode::set_associated_data(), Botan::Salsa20::set_iv(), Botan::ChaCha::set_iv(), Botan::GHASH::update(), Botan::GHASH::update_associated_data(), Botan::CFB_Mode::valid_nonce_length(), and Botan::ChaCha::write_keystream(). Definition at line 43 of file threefish_512.h.